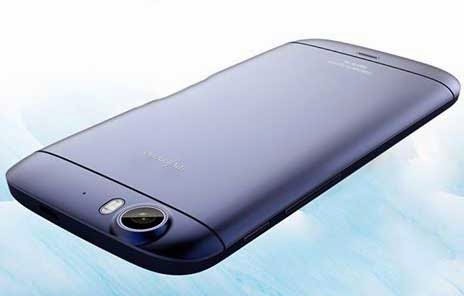 If Samsung, HTC and other leading mobile brands has mini version of their best seller smartphones, Myphone also has its own mini version of their best seller MyPhone Agua Iceberg. After they release the first version of Iceberg it takes four months to come up the concept of releasing this mini version of the same phone model. If you’re a MyPhone fan I’m sure you know how great the features of the first known Agua Iceberg is, from internals to design almost all of us were amaze of what it has. 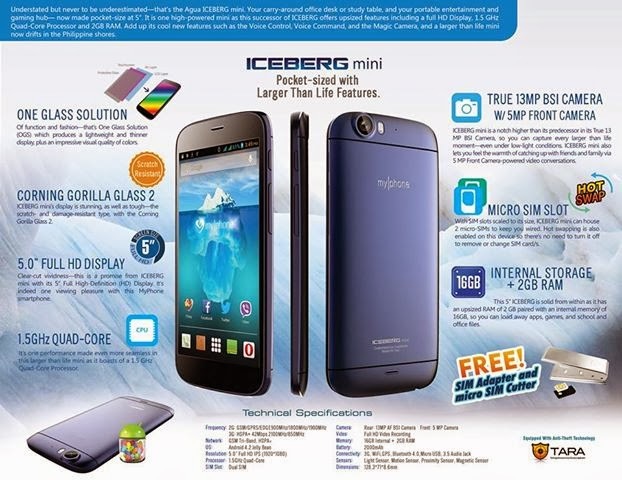 Now let’s talk about the Iceberg Mini, after the series of teaser photos from MyPhone Facebook will look back the featured key specs from posted images. MyPhone Iceberg Mini is still powered by a quad core processor clocked at 1.5GHz. This is not just your ordinary called quad core; it runs on the latest Mediatek MT6589 chipset boasted with turbo speed and power. It comes in full HD display at 1920x1080 resolution on a 5 inch diagonal screen display. This mini version is still coated with Corning Gorilla Glass 2 for a scratch free screen. Another good display features on this phone is the OGS technology that maintain its thin design and lightweight display. OGS (One Glass Solution) also adds impressive color quality when viewing from side to side together with clear full HD resolution. We’re not expecting that the camera feature of this mini Iceberg will go up one more megapixel higher than the first one. It has 13 megapixels rear camera shooter and 5 megapixels for front side. Though Myphone cut the size down to fit on your pocket still some features were beefed up just to offer us a deserving version of Iceberg Mini. Another proved that this phone is featured packed; it has a Magic Camera that lets you erase, animate and add life or motion on your taken photos. When it comes to storage Iceberg Mini still gives more for you, from 16GB internal storage you can add up more on that with the support of USB OTG. That’s a good option aside from a expandable microSD or memory card storage. For RAM, it’s now installed with 2GB RAM which is 1GB more than the first version of Iceberg. You can now expect more when it comes to multi tasking on this phone. 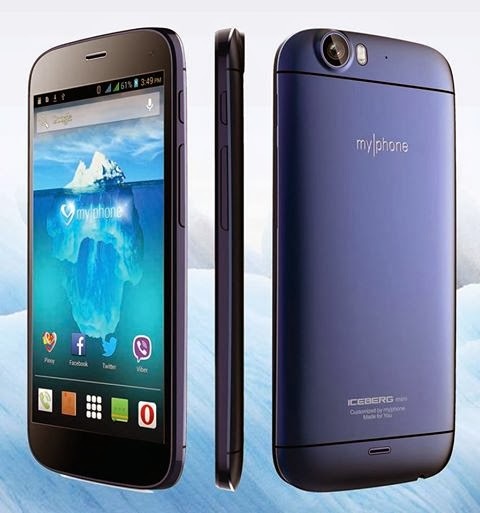 MyPhone Iceberg Mini runs on Android 4.2 Jellybean OS with Clever Motion, 3G capable, Voice Command, Video Multi-display, SIM hot swap and other cool features. For only 12,888 pesos suggested retail price you can take home this mini Iceberg this Christmas. Here’s more to convince you to get one unit, it’s available via postpaid or installment plan using participating banks. Get it for 537.00 pesos a month good for 24 months or you do also have an option to pay it on a shorter (12) months.